Gepost door My Scrambled Style op 10:30 a.m.
Antwoordt op je vraag ,Het was ergens in frankrijk :P volgens mij begin alpen ik weet zo even niet hoe het daar hete maar als me vriend thuis is zal ik het aan hem vragen. OK, I went back and follow you now! loving the casual look and the shoes really are awesome! I really love this cool look today! The cardigan and the shoes are great! Love this tom-boy style of you! very nice! this is gorgeous! mad about check too. i have a new post up about a shoot i styled, would love to know what you think! Nice casual outfit. I'd like to invite you to my blog and maybe follow each other. Just leave me a comment. followed you back right now. Have a great weekend! Oh leuk leuk! the boyfriend style. Fan! Love this outfit.Cus I love this kind of jean!! 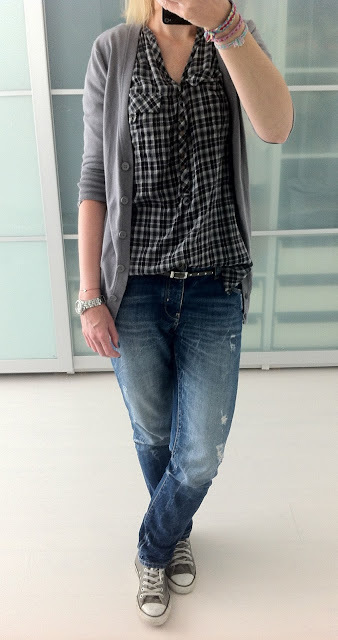 love it, love this casual style! I really like this look, so cool and laid back ;).